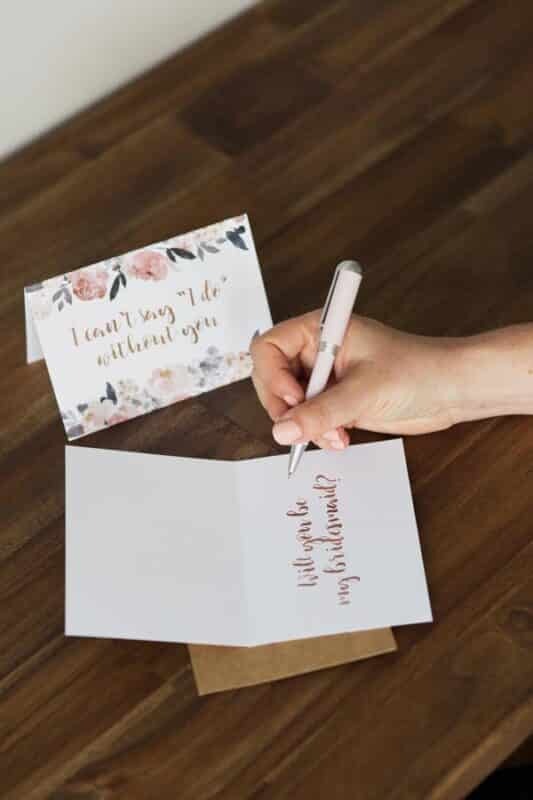 Give your prospective bridesmaids a token that they can keep forever – a card that captures your thoughts on why they’re so important to you, and “pops the question”: will you be my bridesmaid? This bridesmaid proposal card is printed onto the deluxe eggshell card and pronounces “I can’t say “I do” without you” on the front in beautiful copper text. This all important exclamation is framed with beautiful peonies wreaths which match this stationery suite. On opening the card, your bridesmaid will be asked the big question – “Will you be my Bridesmaid?”. There’s plenty of room for writing a lovely note to mark the occasion. Here’s a lovely way to “pop the question” to your bridesmaids – write a personal card, and let the card do the talking. These bridesmaid proposal cards are perfect for asking your special girls to stand with you. A simple, elegantly designed card comes with a colourful high quality kraft envelope, so you have everything you need to “pop the question”. Gorgeous cards, loved that they had a matching MOH equivalent. Bridesmaids adored them. Shipping was quick. Beautiful cards, and such quick delivery! !